Search engines want to show relevant and useful information to their users. They show the websites or content in the search results that is most relevant to what the user is looking for. There are few important and basic aesthetics that one needs to consider in the SEO strategy. How is relevancy of search results determined? The Relevance is determined by both the keywords and website’s popularity factors. SEO is very simple, but most of us complicate it by doing it wrong. Here are some basic things that we usually tend to ignore. 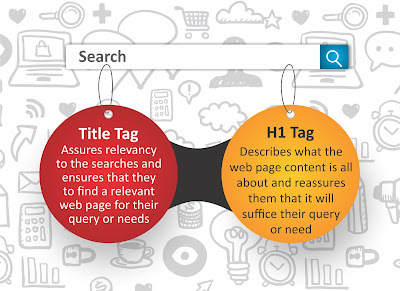 Title tags are words or phrases that define the title your webpage’s content and appears on search engine results page. Where lot of websites go wrong when it comes to SEO is that they overlook Title Tags on their pages, or use very generic tags which don’t actually describe what the webpage is all about. Ideally your title tag should be under 60 characters, as google typically displays 50-60 characters on the search results, and should include your targeted keywords and keyword phrases just once. Also, do not forget to include your brand name in the tile tag, your location (if your brand is location dependent). Meta Description is the content that displays below the title tag on the search engine result pages. Though Meta description does not play a very crucial role in ranking of the webpage, it is very important to get a user to click on your website. First of all, do not confuse between the Title Tag and H1 tag. Unlike Title tags, H1 headings do not appear on the search results page. H1 heading is in large font, acting as a heading to your webpage and is visible only on the webpage. If the H1 Tags are well written they assure the user to stay on the page, thus increasing your session Duration and reducing your Bounce Rate decreases. These two are most important user experience metrics that impact search engine rankings. We have usually find webpages using either no H1 headings or using more than one. Best practice is to use only one H1 tag, use your keyword only once in it, and use it early, and keep it short, under 55 characters. A picture is worth a thousand words. Using relevant images and infographics on your webpage is usually a good practice. Do ensure that your image is clear and its size is not too large as it impacts the loading speed of the website. It not looking makes your webpage appealing and lively to the reader, but also supports in SEO. The alt text describes what the image is all about and the purpose of the image on the page. From SEO purpose you should feed relevant keywords here. By feed I mean not filling alt text with keywords ("keyword stuffing") but rather focus on creating useful information and good content that uses your keywords aptly and in relevant context. Give your images detailed, informative filenames rather than some random name as it can give the search engine clues about the subject of the image. Keep your image name relevant, descriptive yet specific. Now that you know these basic things it might be a correct time to do an analysis of these basic SEO aesthetics on your website. Alternatively, feel free to connect with us for a free website analysis by signing up here.